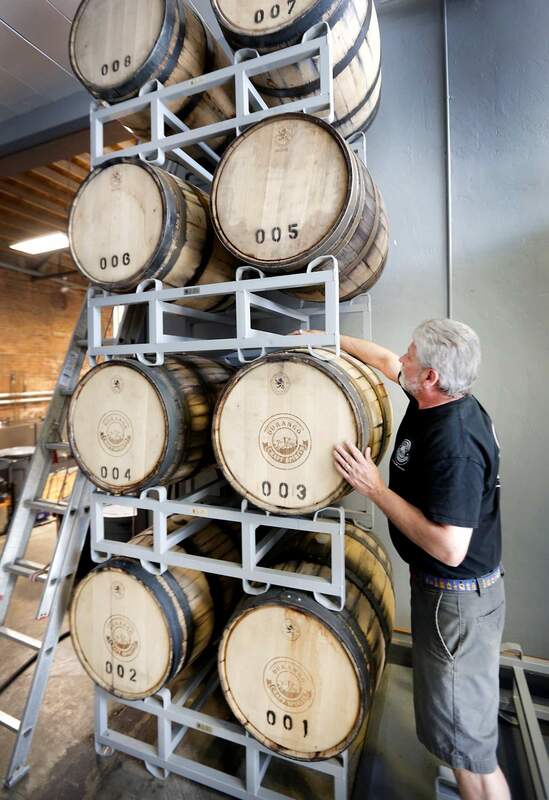 Michael McCardell, owner of Durango Craft Spirits Distillery and Tasting Room, a grain-to-glass distillery producing vodka and white whiskey, checks on aging bourbon at his business on Friday. He is concerned that expanding liquor sales to supermarkets would put small stores that carry his products out of business. DENVER – State lawmakers are working on legislation that they hope strikes a compromise in an effort to eliminate a ballot proposal that would allow beer and wine in supermarkets. At issue is the ballot proposal – being pushed by grocery stores – that would ask voters in November to create a new license allowing supermarkets and convenience stores to sell full-strength beer and wine. Proponents are working through the state process to approve language for a petition. If approved, proponents would need 98,492 valid signatures to qualify for the November ballot. Notably absent from the proposal is liquor. Opposition to the effort has been led by a large group of craft brewers and liquor store owners, who fear that the move would shutter smaller liquor stores, making it difficult for independent brewers to place their products on shelves. Opposition also has come from distillers, who say the ballot proposal tilts the playing field toward beer and wine by excluding liquor. If smaller liquor stores were to close, and distillers were prohibited from placing their products in supermarkets and convenience stores, then they would essentially be shut out of the market. Even with the proposed legislation, distillers, liquor store owners and brewers fear a limited marketplace. “The problem still is that ... it is enough to put a lot of the mom-and-pop liquor stores out of business,” said Michael McCardell, owner of Durango Craft Spirits Distillery and Tasting Room, a grain-to-glass distillery producing vodka and white whiskey. Lawmakers working on the legislation say proposals run the gamut. Ideas include a sweeping effort to allow beer, wine and liquor in supermarkets; permitting liquor stores to carry more than one retail license; phasing in beer and wine in supermarkets so that liquor stores have time to prepare; and capping the number of liquor licenses for retail establishments altogether so that new grocery stores would be required to purchase a new license. “In an ideal world ... if we passed a bill that allowed some form of sales of beer and wine in grocery stores, then there would be an agreement not to pursue the ballot initiative in the fall,” said Rep. Dan Pabon, D-Denver, who has been part of discussions. “No one is happy about any of this, and I think that’s the challenge we have before us, is how unhappy are people willing to be in order to compromise on something like this,” Pabon said. But the opposition side of the initiative does not appear eager to compromise. Mike Rich, owner of Wagon Wheel Liquors in Durango, said the current system has empowered craft brewers and distillers to grow, which has also helped his business. He added that most smaller liquor stores aren’t looking to apply for multiple retail licenses, as owners wouldn’t have the funds to expand. Eric Reller, spokesman for the Distilled Spirits Council, the national trade association for distillers, said his group is working with lawmakers. A spokesman for Keep Colorado Local, the opposition campaign, declined to comment until final language of the bill is available. The campaign has opposed proposals to allow hard liquor sales in grocery stores in the past. Meanwhile, proponents of the ballot effort said they are open to a compromise, but that if lawmakers fail, they will march forward with the initiative. “We’re pleased that others in Colorado’s adult beverage community are in agreement with what consumers have been saying for years – that Colorado’s laws are antiquated and changes benefiting the customer are necessary,” said Georgie Aguirre-Sacasa, campaign manager for Your Choice Colorado. Beer, wine cheaper if sold in supermarkets? Beer and wine in grocery stores?